Spider-Man battles the Lizard alone - and fights alongside the Mighty Avengers! 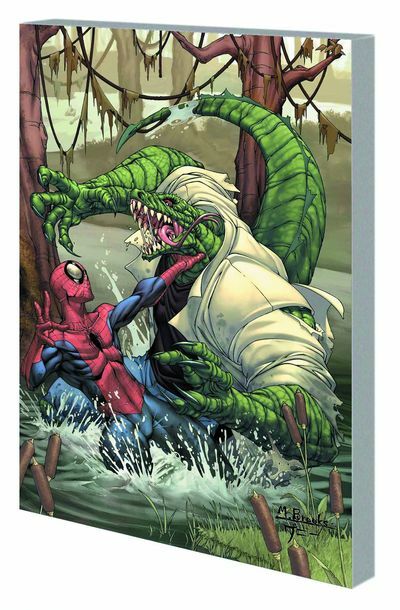 First, Dr. Curt Connors lures Peter Parker and J. Jonah Jameson deep into the Florida Everglades in a retelling of Spider-Man's inaugural encounter with the Lizard! Then, when Dr. Connors reverts to his reptilian alter ego, only Peter can help. But does even Spider-Man stand a chance against every reptile in New York City? Plus: The Wrecker, the U-Foes and the Juggernaut all hate the Avengers. Can our heroes survive the onslaught when these vicious villains join forces? And when villains challenge the Norse Gods, the Avengers come to the aid of their teammate, the Mighty Thor - and mortals and gods alike face Ragnarok! Collecting MARVEL AGE SPIDER-MAN #5, MARVEL ADVENTURES THE AVENGERS #8 and #15, and MARVEL ADVENTURES SPIDER-MAN #16.